Good news for Google Chrome users: the latest version of the browser supports extensions, so you can extend its default functionality by installing extensions from the official extension repository. While the repository offers only a few hundred extensions (compared to several thousand add-ons available on Firefox), it does feature a few neat modules that can make your browsing more productive. Things To Do is a pretty nifty extension that turns every new tab into a to-do list. Install the extension, and next time you open a new tab, you'll see a simple to-do list. To add a new task, start typing in the empty field. Using the buttons you can then move tasks up and down as well as delete them. Obviously, Things To Do won't replace a dedicated task manager, but it can come in rather handy for quickly jotting down tasks before you forget them. 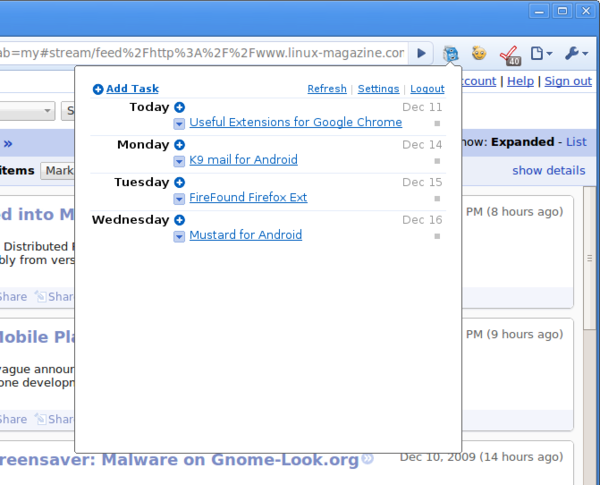 If you use Remember The Milk as your task manager of choice, then you'll appreciate the ChromeMilk extension. Using a dedicated button in the main toolbar, you can quickly access your tasks and manage them from the convenience of your browser. ChromeRIL is a must-have extension for fans of the Read It Later service which allows you to save Web pages for later reading. While ChromeRIL is not on par with the Read It Later add-on for Firefox, it does allow you to bookmark and sync pages with the Read It Later service. Also, unlike the Firefox add-on, ChromeRIL doesn't save bookmarked links locally and it only displays the five latest bookmarks. Still, if you use the Read It Later service extensively, ChromeRIL makes a handy tool for saving pages for later reading. Bit.ly is the king among link shortening services, and the Bit.ly extension lets you access the service's features right from within the browser window. Pressing the Bit.ly button automatically shortens the URL of the currently viewed page and opens a sidebar which provides access to other useful features. Here you can tweet and share the shorten link as well as see link statistics. In addition to that, the extension adds the link preview feature, so when you hover the mouse pointer over a shorten link you can see the full link in a pop-up window. Being an avid Flickr user, I personally appreciate the Fittr Flickr extension. Once installed, the extension adds keyboard shortcuts, a quick link to EXIF info on a particular photo, the lightbox feature for previewing large photos and a link for viewing the photo on a black background. In addition to that, Fittr Flickr adds the tag autocompletion feature and it lets you easily copy the shortened URL of the photo into the clipboard.